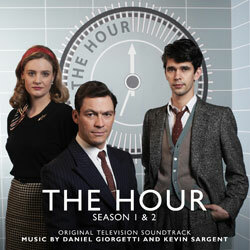 Beginning in 1956, the two series of BBC TV’s The Hour captured perfectly the era of television news as current affairs programmes expanded with a global reach, adding to the storyline a veneer of mystery and intrigue behind the scenes. The series was nominated for BAFTA and Golden Globe Awards. Season 1 featured music by Daniel Giorgetti and season 2 by Kevin Sargent. Giorgetti studied composition at the Royal College Of Music and past work includes The Somme, The Last Days Of The Raj and Foyle’s War. Sargent was a member of the influential dance-rock band Thrashing Doves before becoming a media composer on projects such as We’ll Take Manhattan and an Ivor Novello nominated score for A Waste Of Time. With title music inspired by ticking clocks, 50s cool and the chimes of Big Ben the score is a landscape of classy jazz arrangement which brilliantly evoke the era.